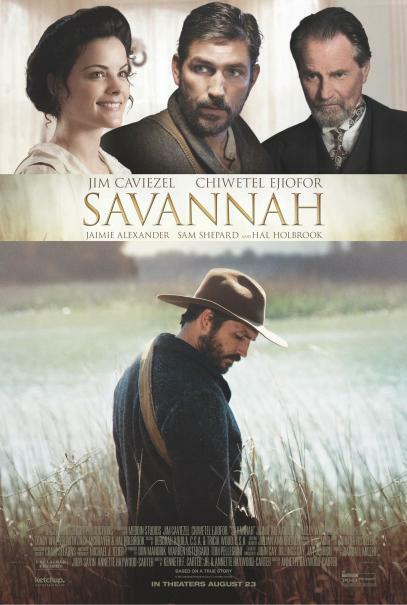 In Annette Haywood-Carter’s Savannah two things never change; the river that flows through the growing town of Savannah, Georgia, and Gil Talmi’s music. From the opening scene to the final credits the music’s air of sweet, rueful happiness remains unchanged. Perhaps the music represents the mindset of the former slave, Christmas Moultrie (Chiwetel Ejiofor) through whom the events in the film are narrated, as he lives out his immense old age in a rotting shack near the banks of the Savannah River in the early 1920s? It is meant to indicate an old man at peace with his long memories, forgiven all the wrongs done to him since his childhood, and now reflects on his own past and those he loved and lost with a magnanimity as broad as the river itself. The recollections centre on the eccentric figure of Ward Allen (Jim Caviezel) the Oxford educated heir to a plantation, who renounces his inheritance to live a simple life as a duck hunter on the river. Allen constantly finds himself in court on charges of hunting out of season, where he delivers highly rhetorical harangues on the rights of duck hunters and is usually let off by an indulgent judge (Hal Holbrook). When he makes an ill-advised marriage to the daughter (Jaimie Alexander) of a prominent burgher (Sam Shepard), his jealously guarded life of freedom and irresponsibility comes apart. He is singularly unsuited to marriage, and his abominable neglect of his young wife (regularly abandoning their marriage bed to go and drink and act like a yahoo in town) is the tragic story at the heart of this narrative. During these terrible years Allen publishes a handful of articles in a newspaper where he espouses a philosophy of wildness and the ‘natural man.’ But as he’d already said to his fiancé early in their courtship (perhaps the only example of self-insight that he displays) he is “no latter-day Thoreau,” and so the argument feels like a justification for his failings as a husband. Ironically his wife would be happy to share his adventures on the river, but it’s him that insists she remains a homemaker, and so turns her into the very thing that he most wants to flee. In other words his continuing pursuit of life as a ‘natural man’ involves denying her the right to be a ‘natural woman,’ and as he’s unwilling or incapable of giving her children, the unnatural role he’s assigned her becomes a prison. It can only end in tears, and the sadness of the story is compounded by the fact that for all his eloquence Allen is deeply inarticulate, unable to express his impulses coherently. Ultimately he seems to me, not so much as a ‘natural man’ but at best a misfit, at worst, a delinquent. Any intimations of homosexuality, especially between a white man and a black man, remain as unspoken in the film as they would’ve been in Georgian society of the time. One wonders what Tennessee Williams would’ve made of this particular specimen of US southern masculinity. Meanwhile, as this terrible story unfolds, the sweet music continues unperturbed, as if ultimately indifferent to the vicissitudes of human happiness, or perhaps more pessimistically, as if the tragic story we witness through the recollections of the old black retainer, is simply part of the natural order of life and death on the great river; that ‘natural man’ and ‘natural woman’ are profoundly incompatible, and that no human agency or civic responsibility can trouble the eternal flow of nature. Which is why the film’s most obvious lurch into hagiography (when Allen holds his arms up in supplication to the great river before throwing himself in) seems so hollow and selfish; a gesture of ownership rather than surrender. The God he’s supplicating may forgive him, the Foundations that perpetuate his memory as one of Georgia’s favourite sons may venerate him. But it’s very hard for me to understand what this man is about.